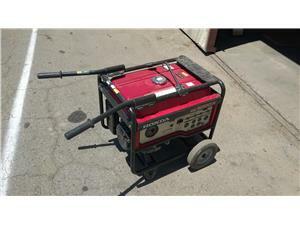 Description: Generator, 5000 Watt, Portable. 37.5 Amp @ 120 Volt (18 Amp @ 240 Volt), GFCI, 72 dB(A), Fuel consumption 8.1 hrs. @ full load (11.2 hrs. @ 1/2 load). Includes wheel kit and handles.